For the mountain in Bolivia, see Achuma (Bolivia). Echinopsis pachanoi (syn. Trichocereus pachanoi) — known as San Pedro cactus — is a fast-growing columnar cactus native to the Andes Mountains at 2,000–3,000 m (6,600–9,800 ft) in altitude. It is found in Argentina, Bolivia, Chile, Ecuador and Peru, and it is cultivated in other parts of the world. Uses for it include traditional medicine and traditional veterinary medicine, and it is widely grown as an ornamental cactus. It has been used for healing and religious divination in the Andes Mountains region for over 3,000 years. It is sometimes confused with its close relative Echinopsis peruviana (Peruvian torch cactus). Echinopsis pachanoi is native to Ecuador and Peru. Its stems are light to dark green, sometimes glaucous, with a diameter of 6–15 cm (2.4–5.9 in) and usually 6–8 ribs. The whitish areoles may produce up to seven yellow to brown spines, each up to 2 cm (0.8 in) long; the plant is sometimes spineless. The areoles are spaced evenly along the ribs, approximately 2 cm (0.8 in) apart. 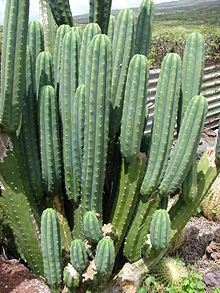 Echinopsis pachanoi is normally 3–6 m (10–20 ft) tall and has multiple branches, usually extending from the base. The tallest recorded specimen was 12.2 metres (40 ft) tall. White flowers are produced at the end of the stems; they open at night. The flowers are large, around 19–24 cm (7.5–9.4 in) long with a diameter of up to 20 cm (7.9 in). There are black hairs along the length of the tube leading to the flower. 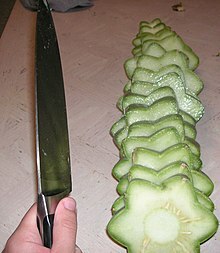 Oblong dark green fruits are produced after fertilization, about 3 cm (1.2 in) across and 5–6 cm (2.0–2.4 in) long. The San Pedro cactus contains a number of alkaloids, including the well-studied chemical mescaline (0.21–1.8%), and also 3,4-dimethoxyphenethylamine, 3-Methoxytyramine, 4-hydroxy-3-methoxyphenethylamine, 4-hydroxy-3,5-dimethoxyphenethylamine, anhalonidine, anhalinine, hordenine, and tyramine. Mescaline (3,4,5-trimethoxyphenethylamine) is a psychedelic drug and entheogen, which is also found in some other species of genus Echinopsis (i.e. Echinopsis lageniformis, Echinopsis peruviana, and Echinopsis scopulicola) and the species Lophophora williamsii (peyote). There are various mescaline extraction techniques, simple (simmering in water 5 to 7 hours) and complex (such as an acid-base extraction), the latter technique yielding a material with a significantly higher concentration of mescaline. The San Pedro cactus grows in USDA hardiness zones 8b to 10. 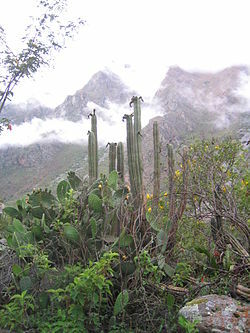 The San Pedro cactus is very easy to grow in most areas. Because it grows naturally in the Peruvian Andes Mountains at high altitude and with high rainfall, it can withstand temperatures far below that of many other cacti. It requires fertile, free-draining soil. They average half a meter per year of new growth. [unreliable source?] They are susceptible to fungal diseases if over-watered, but are not nearly as sensitive as many other cacti, especially in warm weather. They can be sunburned and display a yellowing chlorotic reaction to overexposure to sunlight. In winter, plants will etiolate, or become thin, due to lower levels of light. This may be problematic if the etiolated zone is not sufficiently strong to support future growth as the cactus may break in strong winds. 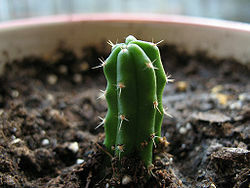 Like many other plants, Echinopsis pachanoi can be propagated from cuttings. The result is a genetic clone of the parent plant. A long cactus column can be also laid on its side on the ground (like a log), and eventually roots will sprout from it and grow into the ground. After time, sprouts will form and cactus columns will grow upward out of it along its length. Like a lot of its relatives Trichocereus pachanoi as a species is easily grown from seed, often by means of a so-called “Takeaway Tek”. This term refers to the practice of the sowing of Trichocereus (and sometimes other types of cactus) seed into plastic containers such as those many food takeaways are delivered in. This creates a semi-controlled humidity environment chamber for 6 months to a year, in which the seed may germinate and then grow relatively unbothered by environmental contamination. In most countries it is legal to cultivate the San Pedro cactus, but in countries where possession of mescaline and related compounds is illegal and highly penalized, cultivation for the purposes of consumption is most likely illegal and also highly penalized. This is the case in the United States, Australia, Canada, Sweden, Germany, and New Zealand, where it is currently legal to cultivate the San Pedro cactus for gardening and ornamental purposes, but not for consumption. ^ Rätsch, Christian (2002). Enzyklopädie der psychoaktiven Pflanzen. Botanik, Ethnopharmakologie und Anwendungen. Aarau: AT-Verlag. p. 15. ISBN 978-3-85502-570-1. ^ a b c d Anderson 2001, p. 276. ^ Bigwood, Jeremy; Stafford, Peter J. (1992). Psychedelics encyclopedia. Berkeley, CA: Ronin Pub. pp. 118–9. ISBN 978-0-914171-51-5. ^ Bussmann RW, Sharon D (2006). “Traditional medicinal plant use in Northern Peru: tracking two thousand years of healing culture”. J Ethnobiol Ethnomed. 2 (1): 47. doi:10.1186/1746-4269-2-47. PMC 1637095. PMID 17090303. ^ Anderson, Edward F. (2001). The Cactus Family. Pentland, Oregon: Timber Press. ISBN 978-0-88192-498-5. pp. 45–49. ^ Crosby, D.M. ; McLaughlin, J.L. (Dec 1973). “Cactus Alkaloids. XIX Crystallization of Mescaline HCl and 3-Methoxytyramine HCl from Trichocereus panchanoi” (PDF). Lloydia and the Journal of Natural Products. 36 (4): 416–418. PMID 4773270. Retrieved 13 December 2013. ^ Anderson 2001, pp. 44–49. ^ “San Pedro Cactus (Echinopsis pachanoi)”. desert-tropicals.com. Retrieved 2008-02-23. ^ a b “What if the cut end doesn’t dry properly and starts to mold” (PDF). Retrieved 2012-02-07. ^ Gilmer, Maureen (January 15, 2015). “San Pedro stays popular as an ornamental plant”. Retrieved 10 February 2019.